Leniolisib, also known CDZ173, is a potent phosphatidylinositol 3-kinase inhibitor (PI3K inhibitor). PWT143, also known as ME-401, is an orally bioavailable inhibitor of the delta isoform of phosphatidylinositide 3-kinase (PI3K), with potential antineoplastic activity. GDC-0077 is a potent and selective PI3K inhibitor. GDC-0077 blocks an enzyme involved in cancer growth called PI3K. SAR260301 is potent and selective Class I phosphatidylinositol-3-kinase (PI3K)β specific inhibitor with an IC50 of 52 nM for this isoform. AMG-511 is a potent and selective pan class I PI3K inhibitor exhibiting IC50 values of 8, 11, 2, and 6 nM against the PI3K β, α, β, and ≤ isoforms respectively. 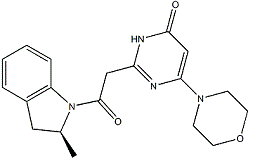 LX2343 is a BACE1 enzyme inhibitor with an IC50 value of 11.43±0.36 μM. LX2343 acts as a non-ATP competitive PI3K inhibitor with an IC50 of 15.99±3.23 μM. LX2343 stimulates autophagy in its promotion of Aβ clearance. 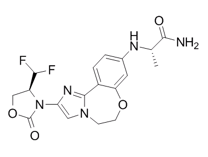 GNE-490 is a highly selective pan-PI3K inhibitor and demonstrates selectivity over mTOR. 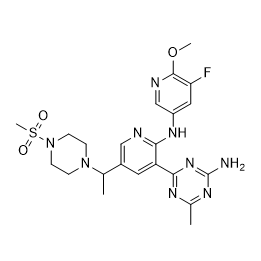 NIBR-17 is a pan class I PI3K inhibitor with IC50 values of 1, 9.2, 9 and 20 nM respectively for PI3Kapha - delta. TASP0415914 is an orally potent phosphoinositide 3-kinase γ (PI3Kγ) inhibitor for the treatment of inflammatory diseases. 2-D08 is a cell permeable, mechanistically unique inhibitor of protein sumoylation.